A smiling face with tightly-closed (boomerang) eyes and open mouth. Upper teeth are shown. 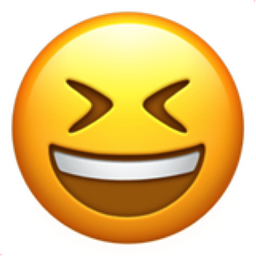 Very similar to the Smiling Face with Open Mouth and Smiling Eyes, but with less bubbly eyes. This emoji first appeared in OSX / iOS after the iOS 5 update.